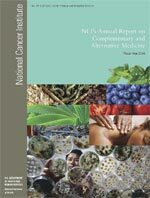 The National Cancer Institute recently released its second annual report on CAM activities, NCI’s Annual Report on Complementary and Alternative Medicine: Fiscal Year 2006. The report covers, in detail, the CAM-related research achievements and ongoing projects that NCI supported in fiscal year 2006. In addition to write ups about extramural and intramural research, the report highlights the Institute’s training, conferences, communications activities, and contributions to the field of cancer CAM research made by OCCAM. Antioxidants and Chemotherapy: Help or Hindrance? To view this report, please visit the OCCAM Web site: http://cam.cancer.gov/docs/annual_report/CAMAnnualReportFY2006.pdf. The Office of Cancer Complementary and Alternative Medicine will be participating in NIH’s first annual Yoga Week this May 19-23, 2008. Highlighting the science and practice of yoga, this five-day series of events will serve NIH employees and the public, allowing participants to learn about the benefits of yoga and experience them first-hand through stretching and practice. The week will include presentations by leading yoga instructors, lectures by current NIH grantees conducting research on yoga, including Dr. Lorenzo Cohen, director of the Integrative Medicine Program at The University of Texas M.D. Anderson Cancer Center, and a discussion of NCI‘s yoga research portfolio by OCCAM Director Dr. Jeffrey D. White. Yoga classes will be taught by local instructors throughout the week. Rachel Permuth-Levine, Ph.D., MSPH, acting director for the Office of Strategic and Innovative Programs at the National Heart, Lung, and Blood Institute (NHLBI), who originated the idea of NIH Yoga Week explains, “Yoga is a fun, energizing activity that offers many health benefits. While people are more aware of yoga and its benefits, many people haven’t had the opportunity to give it a try or explore the many reasons to incorporate yoga into their lifestyle.” To Permuth-Levine, NIH seemed like a great place to bring people together to share their knowledge about yoga, especially since NIH supports research in this topic area. “Whether you’re a novice or experienced student, we encourage you to learn from and enjoy the activities during Yoga Week,” says Permuth-Levine. Permuth-Levine and her team at NHLBI have partnered with the Office of Research Services, the National Center for Complementary and Alternative Medicine, NCI, NIH Recreation & Welfare Association, Weight Watchers International, International Association of Yoga Therapists, Inner Reaches Yoga, and Thrive Yoga. The kick-off event is on Monday, May 19 from 11am-1pm at the Natcher Auditorium (45 Center Drive; Bethesda, MD). All events are free and open to the public. For more information, please visit http://does.ors.od.nih.gov/fitness/yogaWeek.htm.